A Farewell to Arms / Watch Adam Direct and Star in a Short Film! 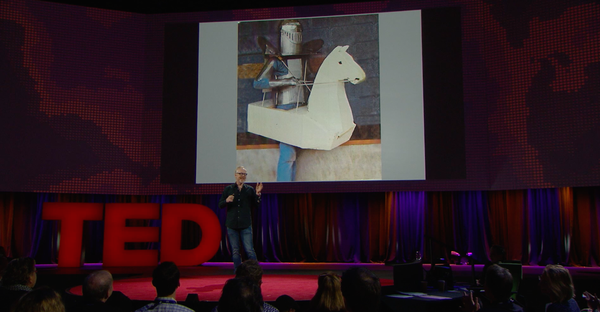 Adam Savage's One Day Builds: Kit-Bashing and Scratch-Building! Adam Savage's One Day Builds: Snub-Nosed Blade Runner Blasters! Adam Savage Makes an Octopus Puzzle! Adam Savage's One Day Builds: Custom Workbench LED Lamp! Making a Skyrim-Inspired Foam Sword! LEGO with Friends: Custom Stay Puft Marshmallow Man! Adam Savage Repairs Totoro Costume! Adam Savage's One Day Builds: Foam Ringwraith Gauntlet! Painting the Realistic LEGO Cosplay Mask! Adam Savage Incognito as a Bear at Comic-Con 2016! Cutaway Millennium Falcon Model Miniature! 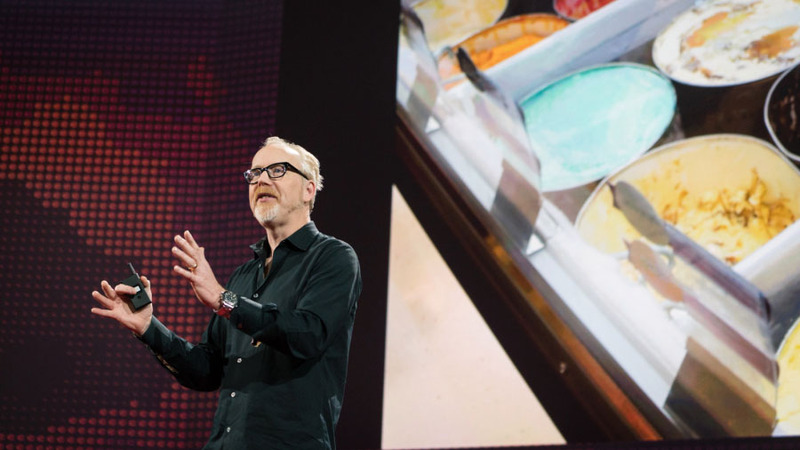 By Adam Savage on July 15, 2016 at 8 a.m.
At 2016's TED conference, I talked about cosplay as storytelling, which is really personal to me. Even more than prop collecting, it's a weird thing to be driven to do. And yet it's important. I was privileged to be a speaker at 2016's TED conference, which was held in Vancouver. You can watch my talk, which was about cosplay, here or scroll below. I had a totally different talk prepared for TED this year, and I threw it out completely two days before I left for Vancouver. Originally my talk was going to be about art and science, which is a talk I want to give someday, but it felt like a lecture. And I'm not a university lecturer. A week before TED I realized this talk didn't have the resonance that I wanted it to. Art and science -- STEAM -- is a topic near and dear to me, but I wanted something more personal. More genuine. Then my wife suggested I talk about costuming. She furiously workshopped the talk with me even after I left for Vancouver, spending dozens of hours with me on the phone. In the end, I wrote most of this at the TED conference itself. Cosplay as storytelling is really personal to me. It's also probably the hobby I'm most embarrassed about. Even more than prop collecting, it's a weird thing to be driven to do. And yet it's important. I feel like in talking about it, I'm trying to be a permission machine. I hope people watch this talk or my Comic-Con panel and feel it's OK to cosplay. And if they do, I hope they Tweet me a picture. Adam Savage's New Warcraft Armor! Tested at the NASA InSight Rocket Launch to Mars! Tested Presents The Rancor Project! Tested Meets the New BattleBots! How to Build a FPV Racing Quadcopter! Astronaut Chris Hadfield Tastes Our Gourmet Space Food! The Silicone Creatures of Immortal Masks! The Shape of Water Creature Maquette! Aurum FX's Destiny Blaster Props! Manas Workshop's Striking Creature Sculpts! Lustre Effects Studio's Hyper Realistic Daruma Dolls! Model Behavior: Retro Moon Suit Garage Kit! Creatures and Garage Kits at Monsterpalooza 2019! PROJECTIONS: Hands-On with Magic Leap Multiplayer Grordbattle! Modeling the Key to Erebor for 3D Printing! Model Behavior: Mech Garage Kit! 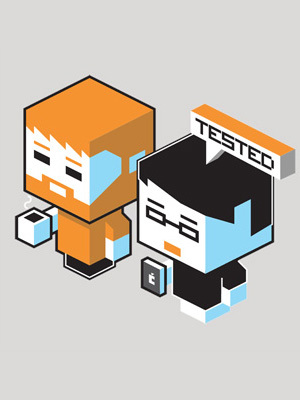 GET AWESOME CONTENT FROM TESTED.COM DELIVERED RIGHT TO YOUR INBOX.